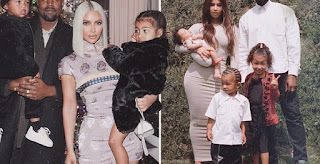 A reality star, Kim Kardashian expecting to welcome her fourth child with husband Kanye West "in few weeks" time, and has disclosed her plan of picking a fit personal names for her children is to make use of "family survey" after they have been born. Kim Kardashian shares first full family picture with Kanye, Saint, North and new baby Chicago. 2018 picture. "But it's usually after the baby's born or we're trying to figure out what the baby looks like. "I usually go about three or four days nameless until I feel that it really connects." The 'Keeping Up with the Kardashians' star who already has North, five, Saint, three, and Chicago, 14 months, with rapper Kanye welcome the idea of naming her son after her 32-year-old sibling, but isn't sure it goes with the rest of her brood's names. She added: "I was truthfully thinking about just naming him Rob. My brother. "But then it's kind of like North, Saint, Chicago, Rob. Meanwhile, Kim recently said she was "frantically trying" to get the nursery ready for her fourth tot. She said: "I'm frantically trying to get the room ready. It's madness, but the best madness." And there could be many more frantic days to come as Kim previously revealed that 'Heartless' hitmaker Kanye wants "seven" children.